Ahh some people have more money than taste. 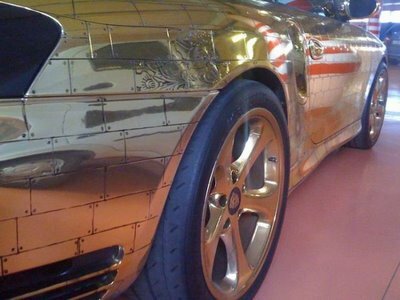 One such person decided to add almost 40 lbs of gold to his 911 convertible. 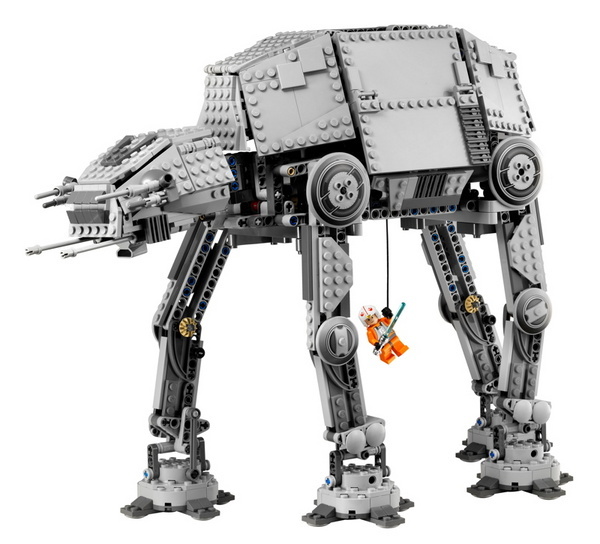 So now it's 40 pounds heavier, and about 90% less cool. 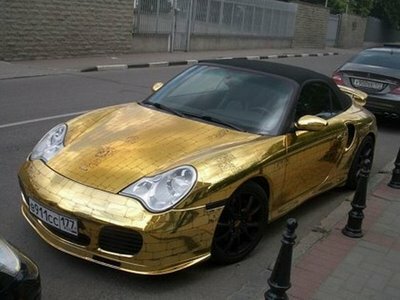 Rich people and their fascination with shiny things, eh!?..... You know what other demographic loves shiny objects? Babies. Coincidence? I think not. 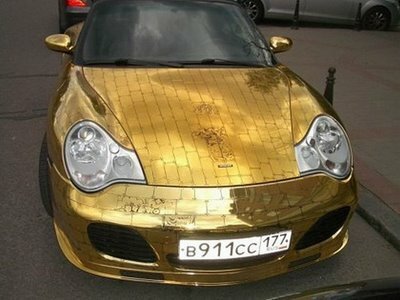 This jazzed Porsche 911 is from Russia. 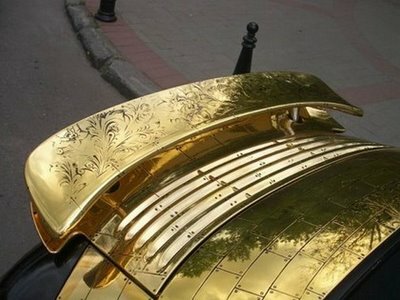 The gold-plated version, is designed by Visualis, in 22 carat beaten gold. 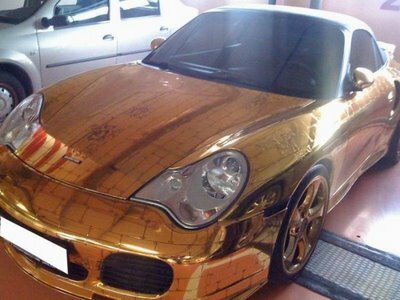 The gold-plated Porsche features all the major components, from the control elements such as the steering wheel and doorknobs to the car body and alloy rims in gold-plated version. 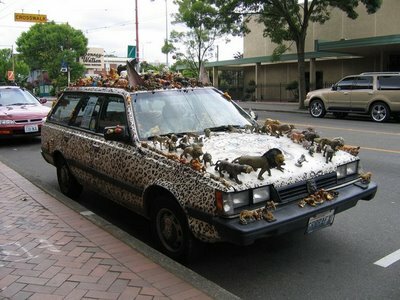 Imagine putting a ding in this car! No that's a mouthful!!.... as is the price which will probably be around €250k when it goes on sale! With a top speed of 325 km/h, acceleration (0-100 km/h) 3.7 seconds, a 5.2-litre V10 and a revised gearbox to handle 552bhp, this is one of the coolest Lambos ever created. Unfortunately you'll have to deal with a nine-month waiting list which might just give you enough time to save up the 200+ grand to buy it!! The above pictures are as close as this pig is ever gonna get to one of these amazingly automobiles! What's new in the car world? 1) Adaptive Cruise Control - Similar to conventional cruise control in that it maintains the vehicle's pre-set speed, adaptive cruise control (ACC) can also automatically adjust speed in order to maintain a proper distance between vehicles in the same lane. Also known as active or intelligent cruise control, it uses a radar and/or laser sensors (usually located behind the grille) to determine the speed and distance of the vehicle in front. 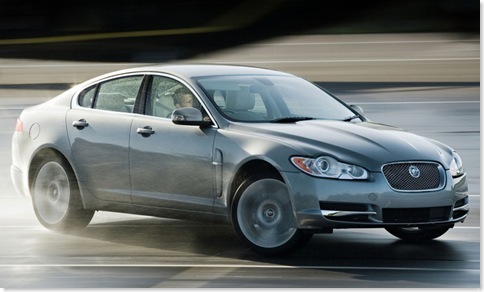 If the lead vehicle slows down, the system sends a signal to decelerate to the engine or braking system. When the distance is computed to be safe again, the system accelerates the car back to its last speed setting. 2) Traffic and Weather Alert Navigation - GPS-based navigation systems equipped with real-time weather and traffic alert systems. The service can alert drivers to severe traffic and weather conditions on the exact route before they drive into them, providing the opportunity to route around a storm's path or find a quick way around a massive traffic jam. 3) Adaptive Headlamps - As a car's steering wheel turns, so do the headlamps, thus illuminating where the driver is looking rather than where the car's front end is pointing. 4) Collision Avoidance - Collision Avoidance monitors the distance and closing rate between the car equipped with the avoidance system and the next one ahead in traffic, or another object on the road. If the system thinks the driver isn't braking soon enough, it tries to attract attention with a selection of tools such as flashing lights, vibrating seats, tugging seatbelts and more. 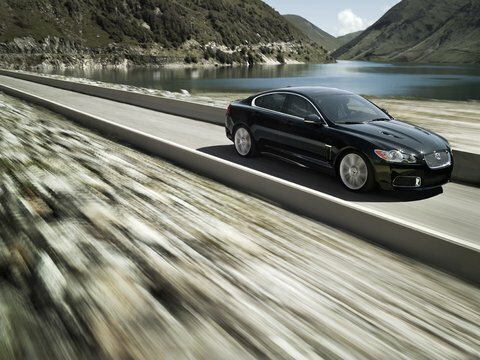 If none of this works, some systems will apply the brakes automatically at the last moment to minimize damage. 5) Lane Departure Warning - Designed to help people who fall asleep at the wheel, inattentive drivers or those simply incapable of staying in their lane, lane departure warning uses cameras to monitor the white and yellow lines on the road. If the vehicle crosses a line without the turn signal being activated, an audible alert warns the driver. 6) In-Car Internet - This new service turns a vehicle into a secure Wi-Fi hotspot using cellular telephone technology, providing passengers with secure Web access for their laptops, video game devices and other equipment. 7) Blind Spot Monitoring - Using camera and/or sonar technologies, blind-spot systems scan a driver's no-see zone. 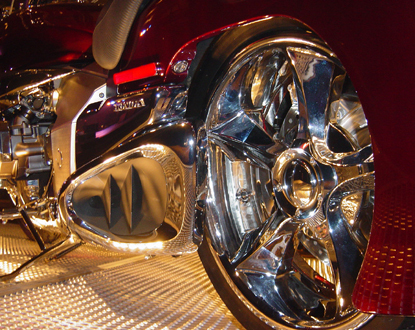 If a car or motorcycle lurks in a driver's peripheral vision and the steering wheel turns, a warning light or audible alarm sounds to warn of the hidden danger — possibly preventing unintentional paint swapping. 8) Round-View Cameras - Cameras strategically located around the vehicle project rear, front and side views on the navigation screen to aid parking in tight spaces. 9) Night Vision - The latest automotive night vision systems use thermal imaging cameras to create a moving video image that helps a driver recognize people, animals and other objects beyond the reach of a vehicle's headlights. Impressed!? VeryHappyPig certainly is!!.... But then again I am easily impressed.... oh wow, look a cat sitting on a wall, now that's impressive!! 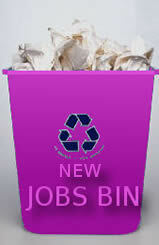 Wishfull Thinking? Not So Much!! 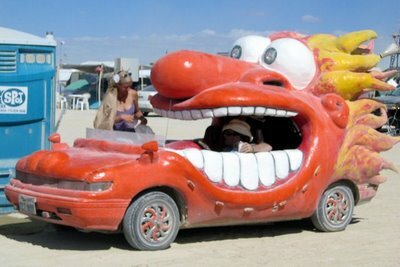 VeryHappyPig just wants people to appreciate their cars, believe me anything is better than this collection of automobiles!! 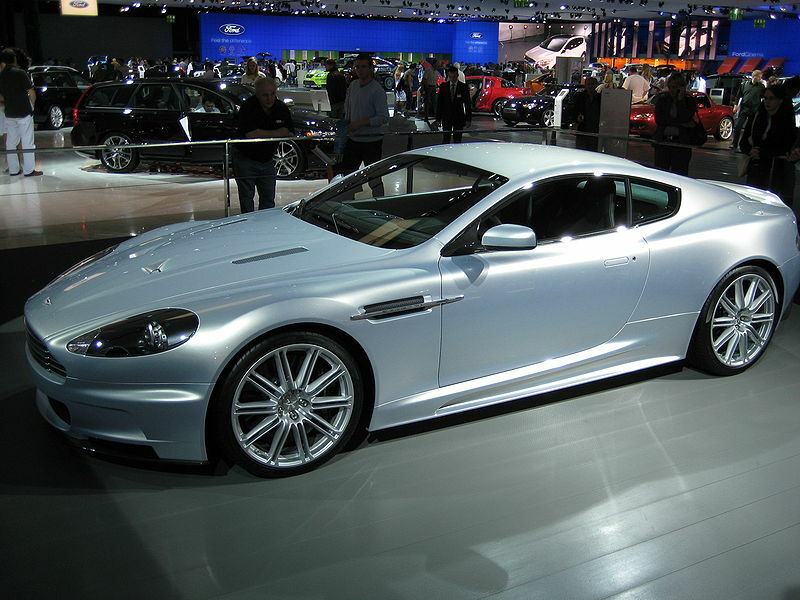 Aston Martin DBS..... 007's Car! 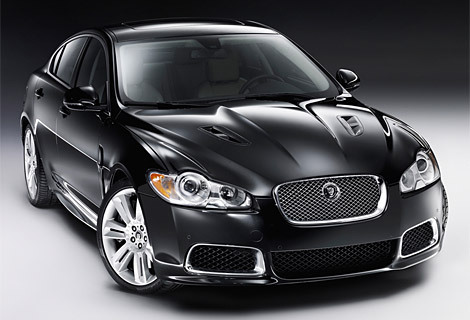 A truly great luxury sports car made famous by 007 James Bond in "Casino Royale". Designed as the ultimate driving experience, the Aston Martin DBS bridges the gap between road and track. Equally at home on a twisting mountain circuit as on the open road, the DBS is a true thoroughbred. The DBS is adorned with all the typical sports car styling cues, including scoops and vents and a carbon-fiber front splitter and rear diffuser with a rather good-looking and superbly executed body kit. And to top it all off, Aston Martin have just released a convertible version of this extremely stunning car!! Ahhhhh, I think I'm going to faint!! So in other words, it is the number one of sports cars!! VeryHappyPig reealllly wants one of these cars...... I'd make a very cool 007 too!! Launched at the Detroit Auto Show, this stunning piece of machinery is powered by a 5.0-litre direct-injection supercharged V8 engine. 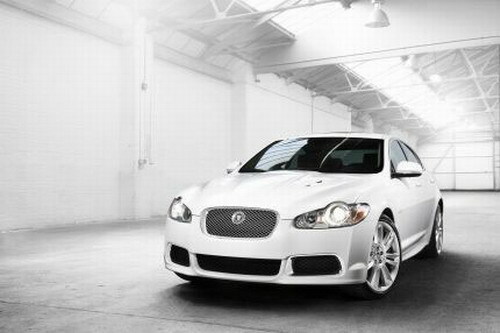 It has a top speed of 155mph, which is electronically limited, and acceleration time from 0 to 60 mph of 4.7 seconds. 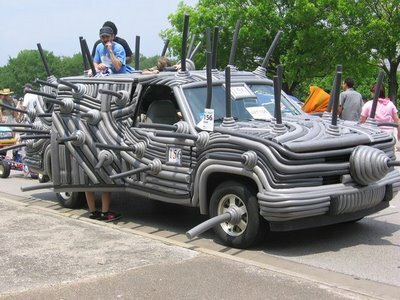 And believe it or not, it goes from from 50 mph to 70 mph in just 1.9 seconds..... Wow! 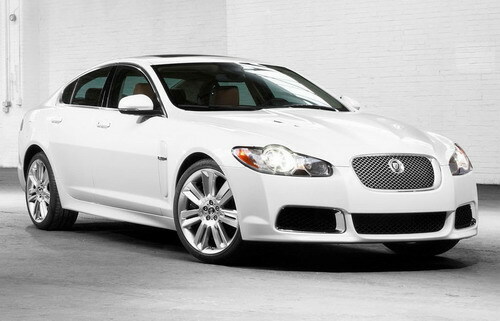 Set to rival BMW's M5, this car is amazing inside and out. It has dark mesh aluminum finish in the fascia and door panels, the latter of which are for the screaming 14-speaker Bowers & Wilkins audio system. 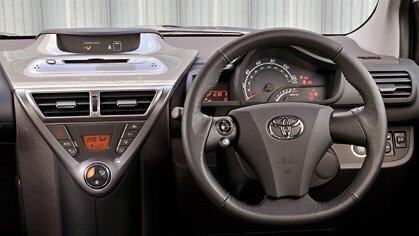 The navigation system gets turn-by-turn instructions in the message center, and there's an acoustically laminated windscreen for quieter motoring. VeryHappyPig is not going to include the price in this one because it's nice just to dream once in a while and the cost will just ruin the fantasy! Herbie..... ah how we loved you. 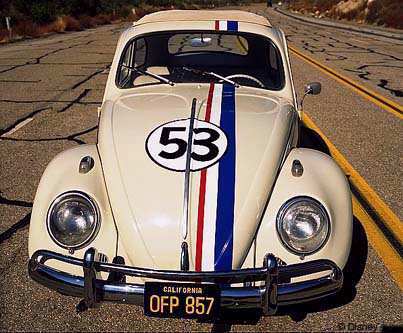 Hebrie first drove onto our screens and into our hearts in the 1969 Disney film, The Love Bug. 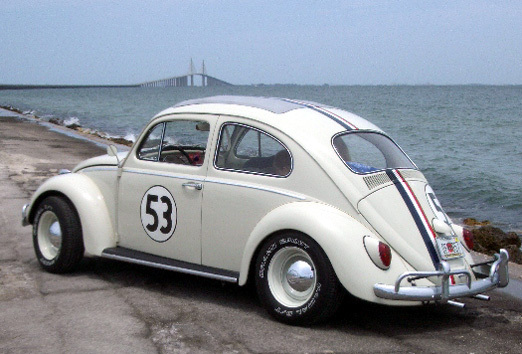 later went on to star in several sequels, "Herbie Rides Again", "Herbie Goes To Monte Carlo", "Herbie Goes Bananas" and more recently "Herbie: Fully Loaded". 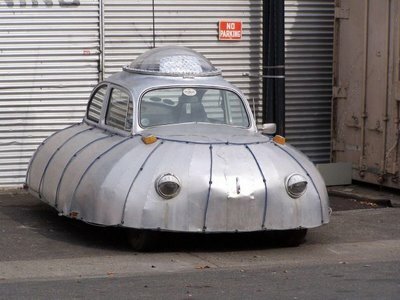 There was also a short lived TV series "The Adventures Of Herbie The Love Bug". Herbie the Love Bug also popped up in a Knight Rider episode, during a chase scene, as one of the "moving obstacle" cars on the road. These were the cars on the road that the knight rider car swerves through on it's way someplace very important! 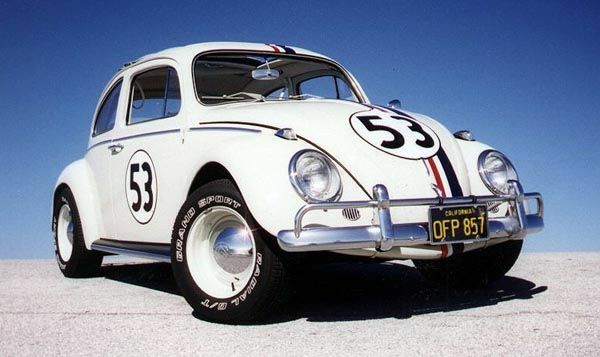 Herbie was actually given his name by a mechanic called Tennessee Steinmetz (Buddy Hackett) in the first film, The Love Bug after his uncle "Herb", who was a middleweight boxer and had permanently broken nose which resembled the front of a Volkswagen Beetle. VeryHappyPig was a huge Herbie fan, what a car.... if only my Lada could drive itself, then I probably wouldn't get pulled over by the cops so much for dangerous driving..... Hooves are not ideal for changing gears, you see! 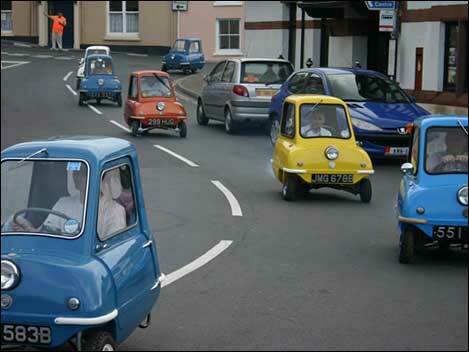 The Peel 50 is capable of making even the most grown up and mature person giggle. 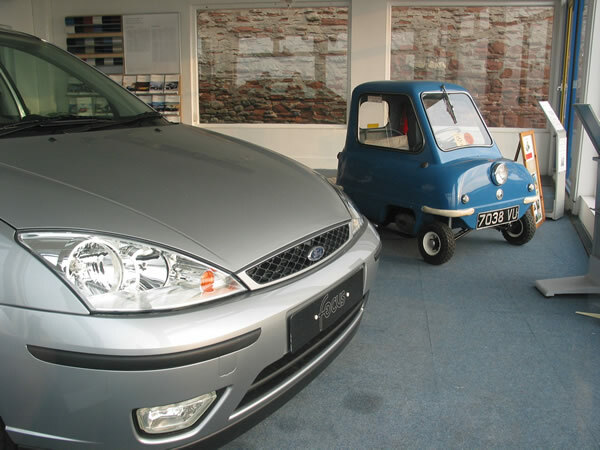 At just 53 inches (1.34m) long and 39 inches (99cm) wide the Peel 50 is currently the smallest 3-wheeler, road-legal car ever produced. With a top speed of just 38mph and powered by a 49cc DKW engine, it was designed to carry one adult and a shopping bag (and a small shopping bag at that!). 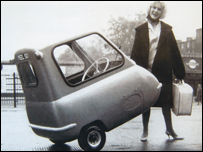 The Peel 50 had no reverse gear, but at just 59kg (132lb) it was light enough to park manually.... by picking it up and pushing it into the space using the handle at the rear of the "vehicle" specifically designed for this reason! Amazingly, the company responsible for the Peel 50, Peel Engineering Company were manufacturers of fibreglass fairings and boats, not cars! 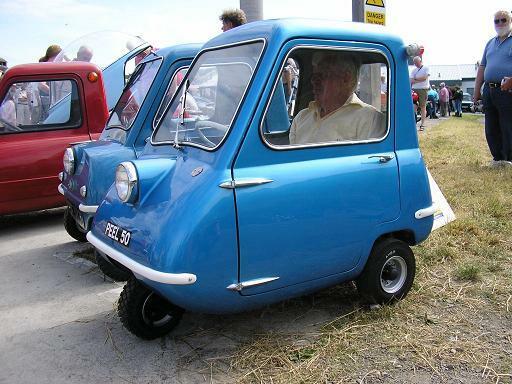 Peel also produced a two seater 3-wheeler called the Peel Trident which featured a clear "bubble top". Approximately 100 of each model were produced between 1962 and 1965. VeryHappyPig is giggling like a schoolgirl looking at this "car". Seriously though, what an ingenius little lunch-box! 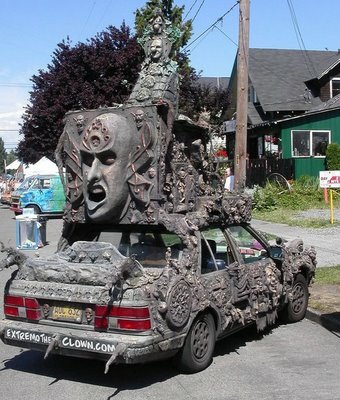 Can Anyone Tell Me, What The Hell Is This Supposed To Be? I know this category is about cool cars, but the pig is confused, what is this tiny, lunch-box with an engine supposed to be?.... 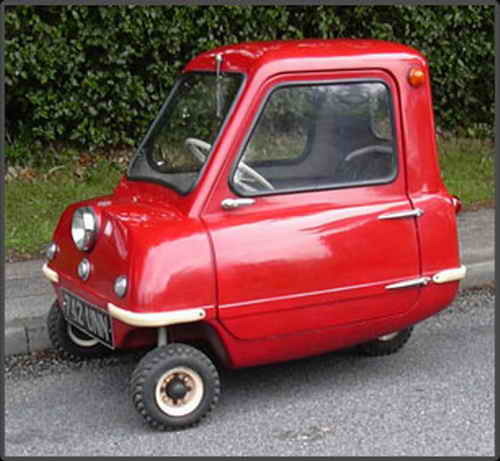 Surely it can't be a car, it's too bloody tiny!!! 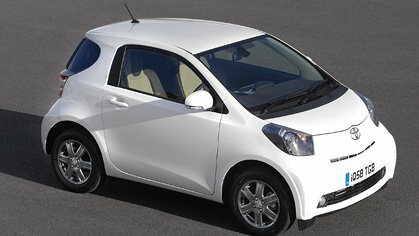 Seriously Toyota, what were you thinking!! Would you believe this itty, bitty car is getting great reviews?!! 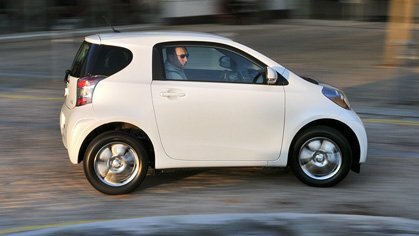 The IQ is Toyota's new city car, it is wide but very short at less than 3 metres long, it is big enough inside for three or at a push four adults, and it's green too as it falls into the lowest CO2 tax band! 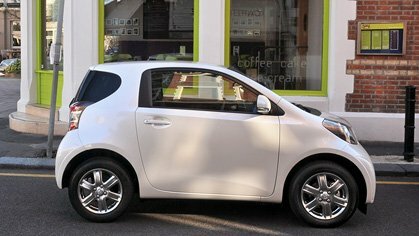 Priced above the Toyota Aygo city car, the new Toyota sits in a niche market all by itself. The four-seat version starts at €14,410, which is dear for a town car but it does have super handling and is nippy in either its 1.4l diesel or 1 litre three cylinder version. She is also very easy on juice. VeryHappyPig would definitely get one.... if I was about 100lbs lighter and could fit into it!! The Most Gorgeous Bike Ever...... and I Mean Ever! 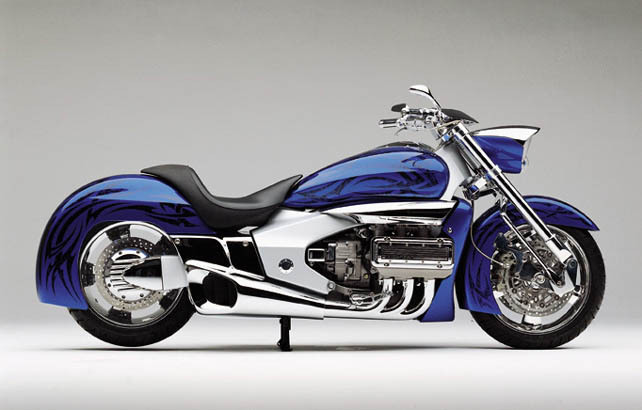 The beauty of this Honda Rune is undeniable, it would bring a tear to a glass eye and rightly so. 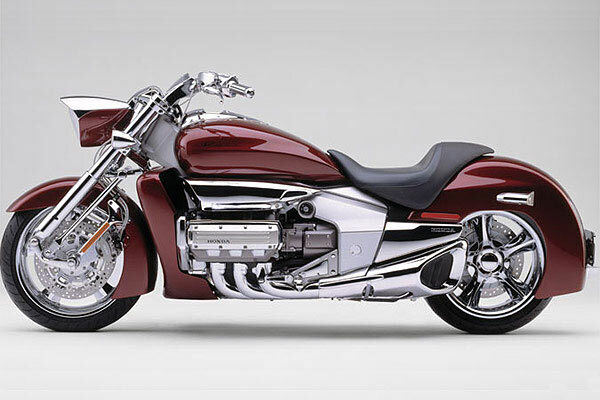 The style of this bike is smooth and big..... and we mean big! 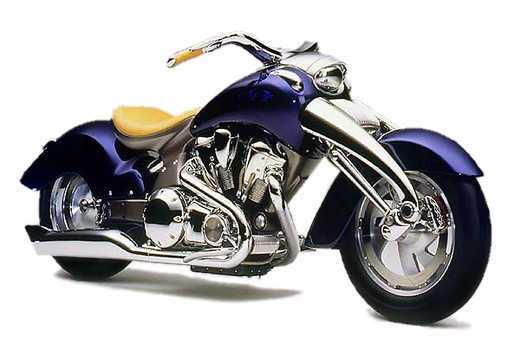 1800cc monster and enough chrome to rechrome all of the Dublin Spike thing! (What a waste of cash that big syringe was!) Just standing in the presence of this supermodel monster is mind blowing! Now some might say they don’t like motorbikes and that’s fair enough but this is not just a bike, it a piece of art and I, thank god, had the pleasure once of riding one of Honda’s masterpieces. 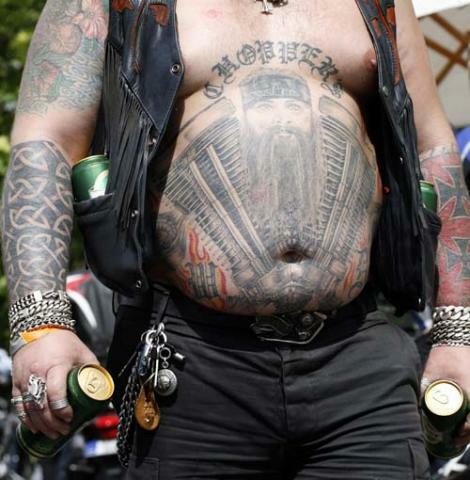 VeryHappyPig is going to get tattooed from head to toe and buy a Rune and go cruising! Going to get my maple-back belly done first! Man, I'd be the coolest piggy ever! To view the Honda Rune In full just press the Piggy link below!